-Lex Luthor goes national with a major announcement. He's isolated the gene that gives metahumans their powers. He can make EVERYONE superheroes, making Superman and his ilk obsolote. This seems to come as a huge surprise to Booster Gold, who can't seem to recall this in his brush through 21st century history. It also comes as quite a surprise to one Clark Kent. -The space heroes have been taken to the ER. A metahuman ER, no less. John Henry Irons gets called in and he arrives in his Steel suit, noting that he's wearing it for "inspiration", meaning he's not. He meets up with Alan Scott and Doctor Mid-Nite, who tell Steel of what happened in Week 4 when they were sent through the Zeta beam. -Apparently, the Zeta beam went HORRIBLY wrong. Among the disasters? Alan Scott lost his eye (and the one he has left isn't his). Firestorm and Cyborg fused together (!) and are now on life support. Supergirl disappeared somewhere (thus the explanation for how she ended up with the Legion of Superheroes). The Red Tornado was destroyed, with a piece of him lodged in Victor's chest. Hawkgirl is 25-feet tall. And Animal Man, Starfire, and Adam Strange are unaccounted for, presumed dead. -When Victor goes into shock, the piece of Red Tornado shouts the android's final words: 52! -Renee Montoya gets a visit from Chief Maggie. They basically say nothing of importance. -Animal Man, Starfire, and Adam Strange are revealed to be, in fact, alive. They're on a tropical planet and while Animal Man and Starfire seem to have suffered no ill-effects of the botched Zeta transfer, Adam Strange has lost both his eyes (!). This was an unexpected (and pleasant) direction this week's issue took. Alan Scott shined in this issue and his emotional strife was evident over losing Jade. I'm very glad that DC didn't kill of Animal Man, as he's one of the few characters in the DCU that can be classified an Everyman, even exuding that personality in this issue. The panels with the very naked Starfire reminded so much of Austin Powers that I halfway expected her to take two of the planet's large melons and put them over her chest. Lex's storyline leaves something to be desired, as I can't help but feel I've seen something like this in an X-Men book. He is, however, currently the favorite to have abducted the missing evil scientists. And they're doing the slow burn with Steel, regarding what happened to him last week. So far, there's only a vague hint that something's amiss with his suit. 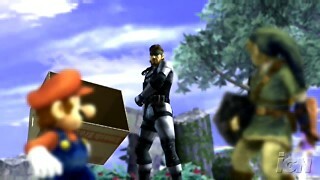 In 2007, SOLID SNAKE~! joins the cast! The W - Print - 52: Week 5 (spoilers) Register and log in to post!